$229.99 & FREE Shipping on orders over $59. Now you can purchase our popular food-grade grape and must handling tools in a money saving package. 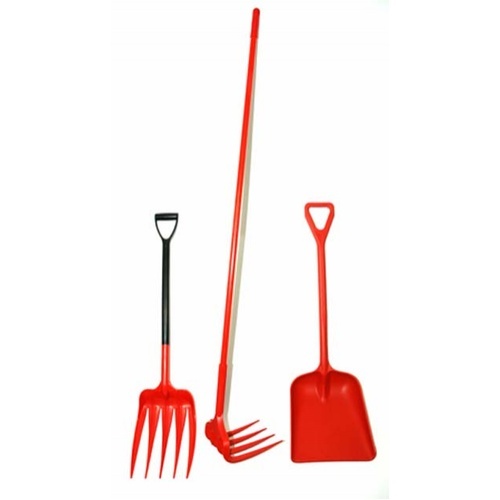 This new package consists of our WE556 Unifork, WE557 Unirake, and WE558 Hygenic Shovel bundled together. This kit provides all the essential tools for direct grape and must handling in your winery. The pitchfork is indispensible for transferring fruit from the bin to the hopper of your destemmer/crusher. With it's flat-faced tines it hold fruit more securely than competitors' designs. The Unirake makes pulling fruit down from an overhead bin a snap. Its long, 5' handle gets even the hardest to reach grapes and must, and its star-profiled tines pierce grapes and must more efficiently than competitors' round-tine designs - ultimately saving you time and effort in your processing. The One-Piece Hygienic Shovel is for transferring must solids from tank to intermediate bin or directly to the press. It is lightweight, durable and easy to clean. The large scoop helps you to get the job done quicker. Food Grade - FDA Approved for direct contact with food and beverages. Efficiently Designed - These tools have been designed to help you get the job done with the least necessary time and effort, ultimately saving you money! Lightweight & Durable - Made from High-Grade Polypropylene, these tools are not only lightweight but they are also virtually indestructable, immune to rust or rot and will never scratch the inside of your stainless tanks. Been looking at them for some time and finally purchased last fall. Great addition to the crush pad.